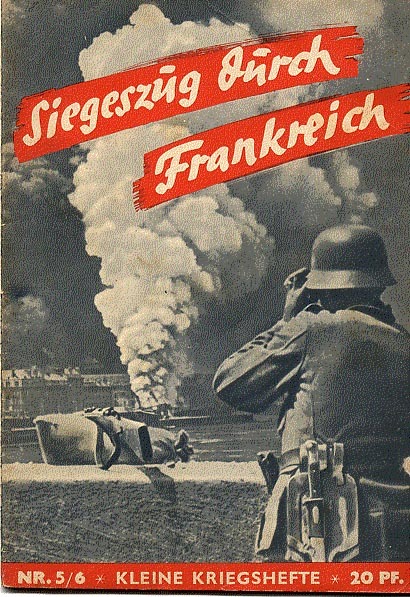 Background: The Nazi Partyâ€™s publishing house published a serious of eight booklets on war during 1940. This one deals with the invasion of France. I here translate one article from it dealing with the Nazi occupation of the Channel Islands, the only part of Great Britain occupied by the Nazis during WW II. The source: “Der erste Griff nach England,” Siegeszug durch Frankreich. Kleine Kriegshefte Nr. 5-6 (Munich: Zentralverlag der NSDAP., 1940). On the wharf in Cherbourg there is a sculpture of Corsicaâ€™s greatest son on a horse. The horse is rearing up and the eye of the emperor is turned toward the Atlantic Ocean, turned toward the place where those people dwell who burned Franceâ€™s national heroine Joanne of Arc. Napoleon did not realize his dream of defeating England. Britannicaâ€™s power reached to the shores of Normandy. To our day, the forward posts of the island kingdom stood before Franceâ€™s doors: the islands of Guernsey, Jersey, Alderney, and Sark belonged to the English crown. Even after France had long since made a mockery of the title of the English king to be “Lord of Normandy,” England ruled the Norman islands in the Gulf of St. Malo. The largest of the islands, Jersey, has 51,000 inhabitants. A bailiff ruled in the name of the King of England, though during the war the real power was held by the lieutenant governor. It was the same for the 43,000 inhabitants on Guernsey. On 1 July 1940 the presses of the Evening Press, the Star, and the Evening News began printing historic editions with large headlines. They announced the “Ordre of the Kommandant of the German Forthes in occupation of the Bailwick of Guernsey, Alderney and Sarc” [the spelling mistakes are in the original]. The German army had conquered the islands, which had not seen a foreign conqueror since the days of the Normans. The British had retired several days earlier to their home island. It was an event of symbolic significance. The inhabitants sense it as well. They have grown accustomed to men in field gray standing watch where formerly the Royal Guernsey Light Infantry stood. “We have been waiting for you  Now we know how things are!” The Germans had been expected, and the Germans had set their eye on the islands soon after occupying Normandy. The commander of the German forces in Cherbourg had observed the island for days and his soldiers, under the white and gray of Lower Saxony, were eager to land on those islands that were so near. They had already been victorious in Dunkirk and Antwerp, and along the River Lys. They were filled with that desire when the admiral commanding our forces in Northern France gave the order to occupy the islands. The preparations assumed enemy resistance. Infantry and marine units landed at Gotenhafen and transports at the Guernsey airport. They encountered reconnaissance units of the Luftwaffe on Guernsey. As soon as the Adjutant and his second-in-command landed at the head of their troops on the island, the Reich war flag was raised. It flew over the rocks and forests of Guernsey and Jersey. The island parliament came to terms with the new conditions. The 79 year-old Bailiff of Guernsey, as head of government, received the German commander with deep respect. In his return visit, he gave particular thanks for the correct and flawless behavior of the occupation troops. Given the long agitation of Englandâ€™s government, the citizens had expected the worst from the Germans. Everyone, old and young, even the educated, were victims of Londonâ€™s propaganda. Half the inhabitants had fled. Hundreds of dogs had been put to death, since the English radio had said that the Nazis took pleasure in cruelly killing the loyal four-footed household pets. At first the islandâ€™s inhabitants were practically invisible. If a German soldier wandered by, he faced anxious looking eyes who followed his path. Soon, however, the blond Hannoverians won the respect and trust of people, who expressed their sentiments in interesting ways. An English lady wrote the German commander to request that her anxious children might meet German soldiers to see that they were not cannibals (!). This was the first letter that Major Lanz received in his new office. Someone else wanted to know what would happen with church services. The German commander put no barriers in the way of religion. He prohibited only the former insults against the German leadership. The question of weapons was readily resolved as well. Sark could keep its ancient cannons, dating back to Queen Elizabeth. The count seneschall retained the ability to deal with the plague of rabbits. Aside from these rather amusing matters, there were more serious economic problems. The export of granite, livestock, flowers, tomatoes, Guernsey apples, apple wine tea, porcelain, and Jersey potatoes stopped. The supply of the islands would have to become difficult within three months, particularly on Guernsey, whose artistic landscape was filled with greenhouses growing tomatoes. The guests in the fashionable hotels got tomatoes for breakfast and dinner. The German commander ordered that half of the land should be planted in other necessary vegetables, e.g. potatoes. One directive quickly followed another. A new legal foundation for economic life quickly was implemented. Some necessary changes in previous English law were implemented. The wishes of the population had to be taken into account. Once under the name of the king, they now were under German rule. The question of the official language was answered in a neutral and impartial manner. The exchange rate between the pound and the mark was established. The sale of alcoholic beverages was halted. The population learned that order and discipline were the best guarantee for their lives and property. These small islands of 117 and 78 square kilometers had little to say about the great events of our day. However, the fact that German soldiers have raised the German flag on territory that was traditionally English is of great significance: London is in difficulty.